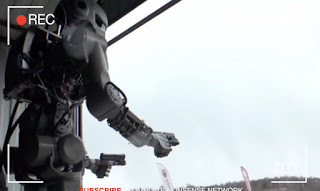 A RUSSIAN tech company teamed up with a military research agency to create a killer robot armed with two handguns that has left the internet terrified. Christened FEDOR – Final Experimental Demonstration Object Research – designers claim the futuristic sharpshooter would initially be deployed during search and rescue missions. "FEDOR was designed as an android able to replace humans in high-risk areas, such as rescue operations,” Andrey Grigoriev, director of Russia's Advanced Research Fund, said.